Kelley's Textbook of Rheumatology delivers the state-of-the-art scientific and clinical know-how you need to offer your patients the most effective diagnosis and care. This rheumatology book’s sweeping updates highlight current advances and breakthroughs that impact your practice. 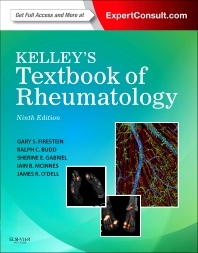 With Kelley's Textbook of Rheumatology, you'll be ready to handle the toughest clinical challenges you face. Search the entire contents online at www.expertconsult.com, download all of images, and watch videos demonstrating the complete musculoskeletal exam, including abnormal findings and the arthroscopic presentation of diseased joints. Review basic science advances and their clinical implications in one place and get dependable, evidence-based guidance with the integrated chapter format that readers of Kelley's Textbook of Rheumatology have always appreciated. Gain a thorough understanding of the "whys" and "hows" of rheumatic disease management with detailed coverage of the very latest breakthroughs and the newest clinical algorithms. "The ninth edition has many positive changes, including in the presentation, such as color coding of sections and charts and diagrams, which have made the information easier to assimilate. The book also provides up-to-date information while keeping with the traditional feel of previous editions. In times where electronic media have taken over print media, Kelly's still draws readers. It is likely the most definitive rheumatology book not only in the U.S., but also in the rest of the world." - Deepali P Sen, M.D. (Washington University Medical Center) Doody 5 star rating!